I have a 1st Generation Xbox 360 which i purchase about a year and a half ago. I connect to my HD-LCD TV via component cables at a resolution of 1080i. I also have a HD-DVD Player which i recently got for free (well $5) at a garage sale on my street. Everything is working wonderful. Both my Xbox and my HD-DVD plays back regular DVD at a resolution of 480p. 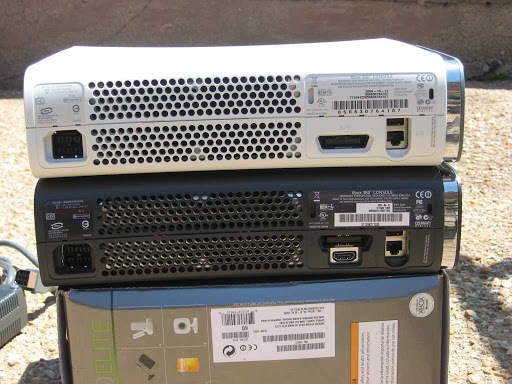 HOWEVER, my roommate just purchased a 2nd generation Xbox 360 (core system), (for less then what i paid for mine btw), which came with an HDMI port. When we played a regular DVD movie via his Xbox 360, the system automatically up-scaled to 1080p (his TV is 1080p). How very angry i was. I called Xbox Support and after a hour and half conversation, i was basically told that only Xbox 360’s with HDMI ports will up-covert regular DVD’s to 1080p. All 1st generation system does not have have ability because of the lack of a HDMI port. When i asked about providing us, the early adopters of the Xbox 360 with a HDMI adaptor for our units so we can then use 1080p gaming as well as up-scale regular DVD movies, i was told one does not exist yet. I was told if i wanted a system with a HDMI port i needed to sell my Xbox 360 and buy a new one that had a HDMI port on it. I don’t know about you, but i find that kind of reply beyond &%&&$. The bottom line here is that as a early adopter, i feel cheated that all these new units can not only plug into the HDMI port on my TV and get 1080p resolution but they can also up-scale DVD’s to 1080p. Which my Xbox cannot. I am stuck now with an inferior Xbox 360, which upscales my regular DVD movies to 480p. Where is the fairness in that? I don’t mind playing my games in 1080i, or even seeing my regular DVD’s in 1080i, but i want to have the same ability that all the Xbox 360’s have when playing back DVD’s with HDMI. This entry was posted in 1080i, 480p, Component, Gaming, HD, HDMI, Microsoft, Xbox 360. Bookmark the permalink.